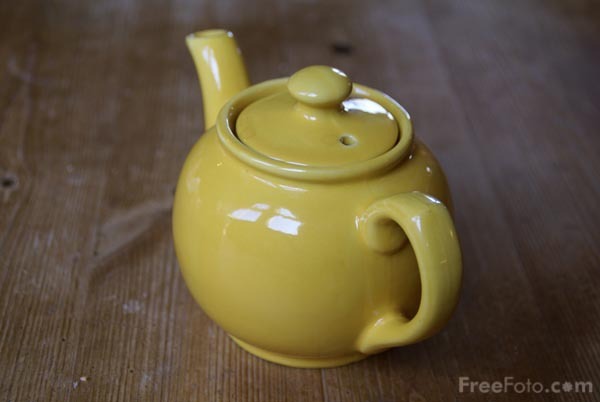 One of these days, I suppose I’ll understand why there are teapots like this. I’m left baffled by the whole set of teapots-in-the-shape-of-other-nonteapotty-things, baffled and wondering how difficult they must be to wash. The February 2008 issue of Realms of Fantasy (with one of my stories plus a whole lot of other cool stories) is now out in stores. Buy a copy! Buy two! Buy three, loan one to a friend, and then convince them to buy one of their own! …er. It’s a little early for megalomania to be setting in, right? And so soon to the non-virtual teapots. This is similar to the one I use most often; mine has a plain white glaze and absolutely no distinguishing characteristics. It’s serviceable, though.